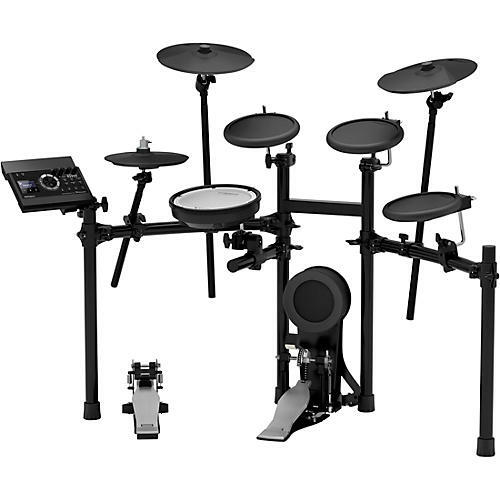 As the newest member of the Roland V-Drums family, the Roland TD-17KL electronic drum set represents the most affordable model in the TD-17 lineup, loaded up with quality sounds, great playability and response, easy-to-use features, and rugged reliability. Equipped with the powerful TD-17 drum module, the TD-17KL also features a responsive PDX-8 dual-trigger mesh snare pad, durable PD-8 gum rubber tom pads, sensitive and realistic-feeling KD-10 kick trigger, two CY-8 dual trigger cymbal pads, a CY-5 dual trigger hi-hat cymbal pad and the reactive FD-9 hi-hat control pedal. The TD-17KL also includes the new KD-10 Kick Trigger Pad; a sturdy, solid kick pad with great dynamic response from delicate playing to thunderous kick patterns. The KD-10 Kick Trigger Pad is compatible with both single and double kick drum pedals. The TD-17 Drum Sound Module features a new set of sounds based on Roland’s popular flagship TD-50. The module is packed with over 300 quality drums, percussion and effects sounds, and 100 kits to cover any musical style. The TD-17 module also includes the ability to import sounds—a first for V-Drums kits in this price range. Combined with built-in sounds and easy sound editing, creating your own custom sounds and kits are virtually limitless. You can even record your performances and save your playing on a standard SDHC card. Internal memory size: 32MB / 100 User Samples (includes preloaded factory samples)/ Total sound length: 295 seconds in mono, 148 seconds in stereo.